The Dolby® Theatre will serve as an ongoing showcase for the latest innovations in Dolby entertainment technology, including Dolby® Atmos™, a breakthrough audio technology that delivers the most natural, life-like sensory experience. The Dolby Theatre also features Dolby 3D, a state-of-the-art imaging solution that provides audiences with a superior 3D experience. Dolby will continue to update the 180,000-square-foot, 3,400-seat Dolby Theatre with cutting edge technologies, ensuring that Dolby Theatre sets the stage for entertainment technology as host of the world's biggest movie premieres, events, and performances, for years to come. 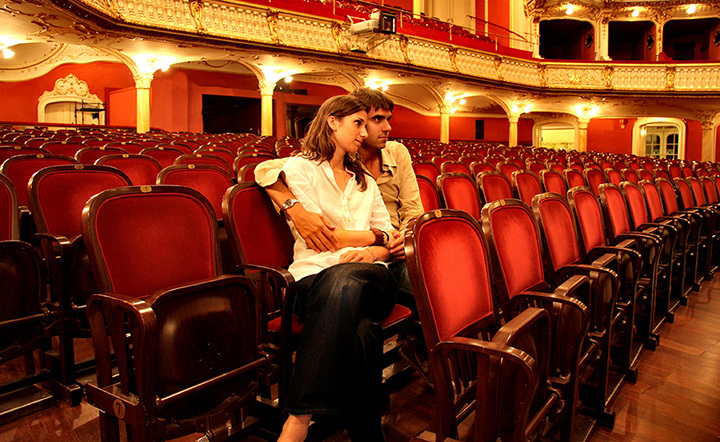 As a first class live entertainment venue, Dolby Theatre has hosted a range of prestigious artists and events including IRIS by Cirque du Soleil, Alicia Keys, Celine Dion, Prince, Elvis Costello, Barry Manilow, Stevie Wonder, Harry Connick, Jr., Melissa Etheridge, Dixie Chicks, Tyler Perry, American Ballet Theatre and various touring Broadway productions. For the theatergoer, the Dolby Theatre experience begins on Hollywood Boulevard, where a towering portal, designed by Rockwell, serves as the grand entrance to the theatre, which is set back from the street. A two-story Awards Walk, featuring backlit glass plaques for each Best Picture Oscar® winner on a series of limestone portals, leads up a sweeping staircase with red mosaic tile to the main entrance.